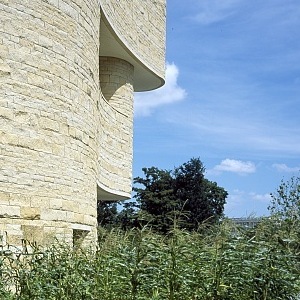 Design Team, National Museum of the American Indian, “Design Team, National Museum of the American Indian,” Histories of the National Mall, accessed April 22, 2019, http://mallhistory.org/items/show/89. Douglas Cardinal (Blackfoot), Johnpaul Jones (Cherokee/Choctaw), Lou Weller (Cado), Donna House (Diné/Oneida), and Ramona Sakiestewa (Hopi) were consultants on the concept and design of the National Museum of the American Indian. They represented a pan-tribal coalition that helped to ensure that the design and landscape of the museum captured some of the diverse values of Native American life. Cardinal was the initial architect and project designer. Jones headed the group that led the design architecture, which included Weller. House and Sakiestewa served as design consultants. Douglas Cardinal was born in Calgary, Alberta, Canada, in 1934, and is of Métis and Blackfoot heritage. He received a degree in architecture from the University of Texas in Austin in 1963. Johnpaul Jones, Cherokee/Choctaw, was born in Oklahoma near Okmulgee, the capital of the Creek nation. He studied architecture at the University of Oregon. In the early 1970s, he joined with two other architects named Jones to form the Jones & Jones firm in Seattle. Louis Weller, Cado/Cherokee, was born in Shiprock, New Mexico. He graduated with a degree in architecture from the University of New Mexico in 1959. He established his own architectural practice in 1980. He died in October 2010. Donna House is a member of the Towering House People Clan of the Diné and the Turtle Clan of the Oneida. She grew up on a Navajo reservation in Arizona. She is an ethnobotanist, someone who studies the relationship between people and plants. Ramona Sakiestewa is a self-taught weaver of Hopi ancestry who grew up in the Southwest. In addition to her work with the Smithsonian, she has consulted for the Kurdistan Regional Government, the New Mexico State Arts Commission, among others.